This is one versatile product from Black and Decker for your kitchen. 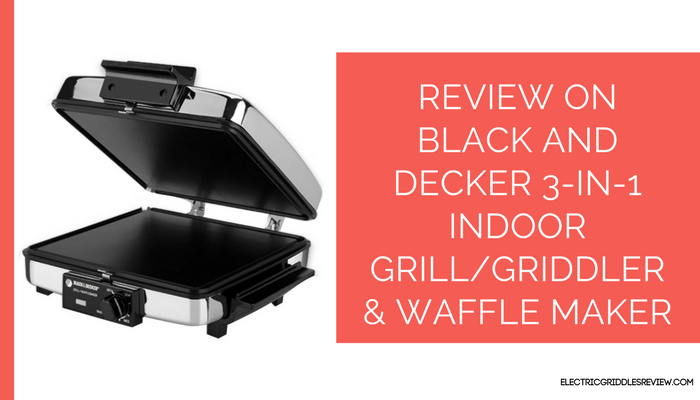 Black and Decker 3-In-1 Indoor Grill/Griddler & Waffle Maker is very handy 3-in-1 kitchen appliance like its name says. 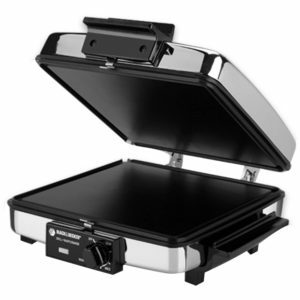 It features Grill, Griddle and Waffle Maker; they are perfect for preparing breakfast, lunch and dinner. It has two 8-inch-square cooking plates and that are reversible. There are grids on one side that allows you to prepare waffles; you can make four waffles at one time. The other side is flat that are capable of top and bottom grilling a sandwich or steak. The top of this black and decker griddle opens up flat forming two 8-inch-square cooking surfaces of a griddle, which is perfect for making pancakes and hash browns and more. Cooking healthy is easy with the grease channels along the edge of this unit that carry oily residues and grease away from your foods. It offers variable temperature controls. You can choose the right amount of heat for whatever food you create. It offers high, low and medium temperatures with the adjustable temperature knob. It also features power indicator light. Cleaning this 3-in-1 appliance is pretty easy despite it size. The nonstick cooking surface releases food easily and it can be wiped clean. The cooking plates are removable that can be removed for scrubbing. As much as it is easy to clean, this griddle grill combo is equally easy to store. The power cord wraps around the hinge and the unit stands upright for compact storage. This black & decker griddle has cool touch handles, which allows easy maneuvering while cooking. Though the cooking plates are reversible, you have to wait certain time for them to cool off before reversing them. Also the grill plates are just as flat as the griddle plates, hence you won’t be getting traditional grill marks on your grilled foods. Cooking anything from breakfast, lunch and even dinner for your family is convenient with this Black and Decker 3-in-1 design. You can start with waffles and then reverse the cooking plates and fold back the hinged top to open flat griddle plates to cook eggs and bacon. You can easily prepare toasty sandwiches or steak for your lunch and dinner with the grill option. Check the price of this 3-in-1 design here. Also, check BLACK+DECKER GD2011B Family Sized Electric Griddle that has established itself as one of the best sellers on Amazon.